Marriott International has announced a set of unified benefits across Marriott Rewards, The Ritz-Carlton Rewards and Starwood Preferred Guest (SPG) for its members in August 2018 creating an incredibly rich hospitality loyalty program in which members will earn on average 20% more points and faster than under the prior programs. For the first time, members will have access to book stays and earn or redeem points among 29 participating global brands comprising 6,500 hotels in 127 countries and territories. Achieve Elite Status and Earn Points Faster: Earn and redeem across the entire portfolio of participating hotels and earn elevated benefits and elite status faster with new elite tiers. Earn Silver Elite Status after just ten nights and Gold Elite Status after just 25 nights. Earn Platinum Elite Status earned after 50 nights and Platinum Premier Elite Status earned after 75 nights. This aligns with the current SPG offering. All Platinum Premier Members surpassing 100 nights and $20,000 of spend will enjoy the highest level of personalized service – the popular ambassador program – along with all the other benefits in that tier. The breakfast offering for Platinum and Platinum Premier members will be expanded to 23 participating brands, including Courtyard, AC Hotels by Marriott, Protea and Moxy, as well as resorts. For certain brands, members will receive free breakfast or an on-property food and beverage credit for breakfast or other dining options. Simpler to Redeem Points: All hotels throughout the loyalty portfolio will have no blackout dates for points redemptions. In addition, a Free Night Award chart with peak, standard and off-peak pricing will be adopted for all hotels. The chart, which will launch with standard pricing in August, will add off peak and peak in 2019. More Mobile Features: When members book directly on Marriott.com, SPG.com or any of Marriott’s mobile apps, they will be able to choose from all 6,500 participating hotels, and also take advantage of exclusive member-only rates and free Wi-Fi. 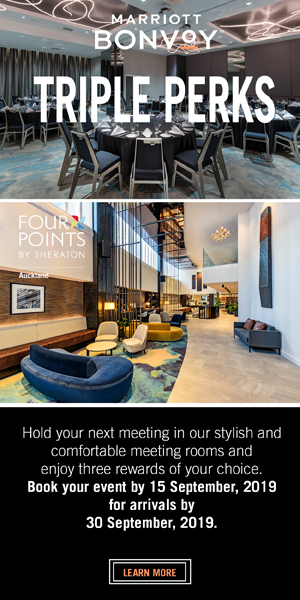 In addition, members will be able to check-in or check out, receive Room Ready Alerts chat directly with hotels using Mobile Requests and where available use their smartphones as their room key on all of Marriott’s mobile apps. Accelerate Earning Points and Accessing Benefits with New, Refreshed Co-Brand Credit Cards: The new Chase Marriott Rewards Premier Plus Credit Card will give card members six Marriott Rewards points per dollar spent at participating hotels, two points per dollar spent on all other eligible purchases, an anniversary free-night certificate for any property up to 35,000 points, guaranteed elite status and much more. The new Starwood Preferred Guest American Express Luxury Card will offer card members six points per dollar spent at participating hotels, three points per dollar spent on airfare and at U.S. restaurants, and two points per dollar spent on all other eligible purchases. Card members will also receive $300 annually in statement credits for on-property purchases, a free night award up to 50,000 points, automatic Gold elite status, a $100 fee credit for Global Entry, Priority Pass Select membership and more. Increased Access to Unparalleled Experiences: Marriott Rewards, The Ritz-Carlton Rewards and Starwood Preferred Guest (SPG) members will earn points every time they purchase one of the new experiences. Experiences range from destination tours and day trips like shark cage diving in Gansbaai, South Africa, to once-in-a-lifetime events. These include exclusive member concerts, VIP experiences to coveted sports events like the Super Bowl and music festivals like Coachella Valley Music and Arts Festival, as well as hands-on master classes and meet & greets with some of the world’s top athletes, musicians and chefs, including among others, actor and musician Jared Leto and his band 30 Seconds to Mars, chef Daniel Boulud and Lewis Hamilton, the four-time Formula One™ World Champion and Mercedes-AMG Petronas Motorsport driver. NZ Business Traveller will bring regular updates to the new loyalty program as and when announced.